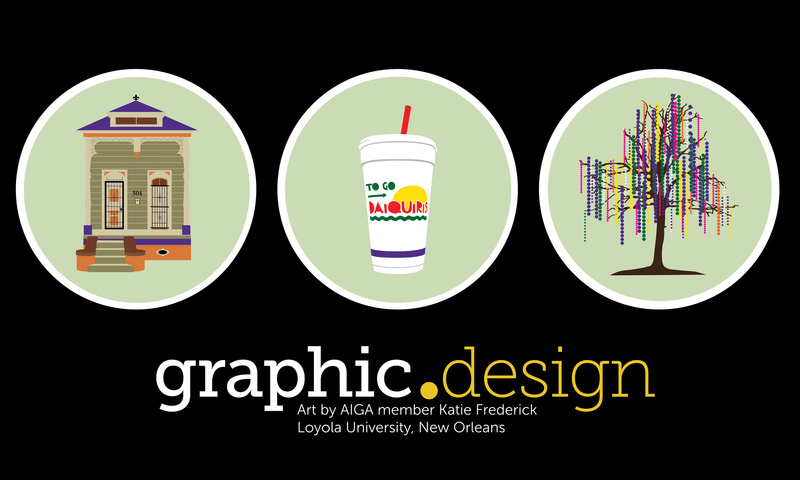 Graphic.design is headed to the AIGA Design Conference in New Orleans this week! To celebrate the city’s best designers-in-the-making, we held a contest amongst members of AIGA’s student chapters. The contest was as follows: design three icons that capture what the Crescent City means to you for the chance to win your own .design domain, $250, and an all-access ticket to the conference! Our winner was Katie Frederick, a junior at Loyola University, New Orleans. Her designs evoked the spirit of New Orleans with an eye towards both tradition and whimsy, past and present. If you’re attending the conference, you will find those icons on our posters, stickers and our booth banner. After she won, we were able to get her on the phone to talk about the icons she designed as well as what got her into the world of graphic design. Had you heard of .design before this contest? How’d you get the idea for the designs? I hadn’t. My advisor sent an email to us so I looked you guys up and it seemed like something I’d want to do. I’ve been wanting to work on a project about the architecture of New Orleans, which is amazing. I was going to go around and take pictures of all the houses and start vectorizing and making little illustrations of them. One of my designs in the contest was one of those illustrations so it worked out perfectly. And how did you get the idea for the other two designs? I asked all of my friends about the first four words they thought of when they thought of New Orleans. Booze and partying was obviously one of the things they said, as well as Mardi Gras. So the tree design came from Mardi Gras and trying not to do a cliched illustration of it. The drink is also iconic. The drinking culture here isn’t about drinking a drink at the bar. You drink it from a to-go cup because you can drink on the street here. I’m sure you guys thought that was hilarious. What would your ideal job or work scenario be after college? I’m not exactly sure anymore. It used to be animation, working at Pixar was something I used to dream about. I’m not sure if that’s exactly what I want now. It’s such a long commitment, years of working on the same scene, the same movie. I don’t think I want that. I’m not really sure what I want right now. I’d love to work for a design firm, maybe in publications and magazines and I’d really love to work abroad. That’s a big goal of mine. If you could choose a place to live and work, where would it be? Right now I’m trying to go to New Zealand. I’m trying to study abroad next semester and if I could do it in New Zealand, that would be amazing. How long have you been involved with design? I was really involved in art and the arts side of things for a long time, but I didn’t know too much about design at the time. The question ended up being, how do I be creative and still get paid? which is when I started learning about design. The more I’ve learned about it and done it, the more confident I am that this is where I belong. Do you feel like you’re gravitating towards one area of design or are you still just exploring? Still exploring. I really am not settled on a particular thing right now. I lean towards very simple designs, but, at this point, I try not to do the same thing or get too much of a style. I’m still a student so I might as well try new things now and have them come out poorly than when I’m working professionally. When you won the contest you got a .design domain, what did you end up choosing? Do you know what you’re going to do with that? it’s going to be a portfolio page. I haven’t set it up yet, but it’s on my business cards so it needs to go up soon! Did you already have a digital place for your portfolio before the .design? Not so far. I haven’t set it up. I have been trying to get it together and get a portfolio that I’m happy with, but it’s very much a work in progress. How’s that going to impact the job search? Is physical portfolio or digital portfolio going to be more important? I think the digital portfolio is hugely important. We had an alumna come speak to us, Lizzie Margiotta, she works in LA. When she was looking for a job she just sent a link to her portfolio to a design firm, nothing else, and they hired her. So it’s definitely really important. Now that you have a .design, is that something you would recommend to your peers or other designers? Definitely. The idea is that the domain is targeted at designers. I think it’s great to have design after my name because I have to say less, it says it for me. A lot of my peers are in the process of setting up their portfolios right now so it’s a great thing to have. Katie’s site is at www.katiefrederick.design, check it out!